From: Frances came from the Tompkins County SPCA in Ithaca, N.Y.; Minchy, bred by a "backyard breeder," came from a family who wasn't able to care for him. 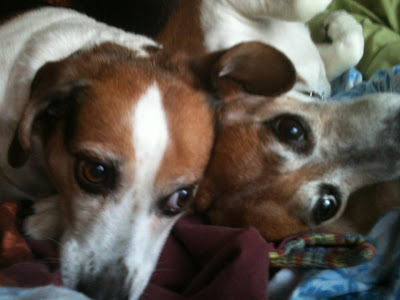 Kerry (who blogs at Hamchuckles) sent the stories of her two dogs—Minchy's was posted on Sunday, and below is Part 2, Frances' tale. Frances' story is a sad one, indeed. We believe she was a breeder at a puppy mill for her early years, then the mill sold her to the research lab at a local university. There, she was bred again and her embryos used for genetic testing. 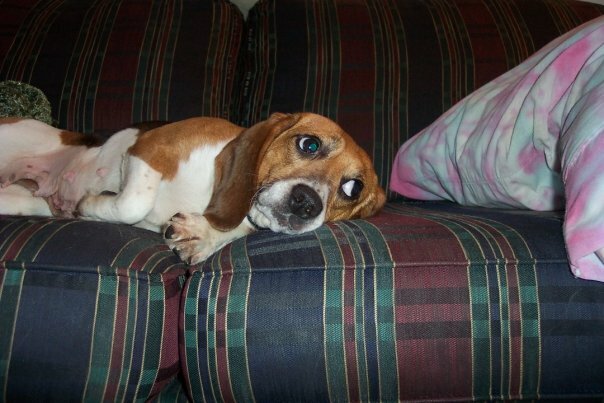 We don't believe she was harmed in any way or overtly mistreated at the lab; the biggest issue was that for the first three years of her life, this beautiful beagle was treated like an object, not a pet. Kept in a cage, never taught to play, known only by the serial number tattooed on the inside of her ear. When her time was up in the lab, she was adopted out to a student. This young man (who named her Snoop) had her for exactly one month before he surrendered her to the SPCA. I happened to be in the intake shelter when he brought her in. His reason for giving her up? The little dog wasn't housetrained very well, scared of loud noises, and worst of all, wanted to be with him all the time. I saw her as he brought her in, so confused that this boy she'd already learned to love was discarding her. I knew from the moment I saw her that she was meant to be mine. She spent five days in the intake shelter before I was able to have her meet Minchy to make sure they got along and then finally bring her to our house. She also suffered from severe separation anxiety and howled so horribly that the woman who ran the intake shelter desk had a hard time hearing the phone. When Serena heard I was taking the loud little beagle home, she rolled her eyes and said, "Good luck! You won't have one minute of quiet with that dog." I wasn't worried, because I'd been taking the dog I'd named Frances out of her run in the intake shelter and up to my office with me for the past couple days. Once out of the actual shelter environment, she was quiet as a little mouse, content to just be near you. When I came into work on Monday after having taken Frances home over the weekend, I happily told Serena how good the little dog had been, and that we were naming her Frances Serena in her honor. Frances had some issues beyond her separation anxiety. Her pelvic floor was weakened from all the litters she'd been forced to carry, and she also needed some reinforcement with her housetraining. She'd spent her entire life in a cage; she'd used the shredded newspaper in her cage as her bathroom. We'd heard that lab rescue dogs are easily overwhelmed by being outside. Having spent their lives in the confines of a space just a few feet square, suddenly being out in the wide open is frightening to them. Again, my dog behaviorist friend helped us out. She told us to reward her with unusually wonderful treats when she "did her business" outside. She suggested bits of liver, stinky cheeses, premium treats. Nothing worked. My friend said it was time to bring out the big guns—baby food. She said baby food (the pureed meat kind) was the end-all, be-all of dog treats, the ultimate. This was proven to us when we offered both dogs a smear of pureed lamb on our finger and Minchy positively quaked in anticipation. Frances? Nothing. We finally discovered that the ultimate motivator for her, the one thing that truly rang her bell was … dry kibble. Yep. The regular old dry dog food she ate every day. We had thought it was cute that she got so excited when we were filling her bowl and bringing her her meals. It made us kind of sad, however, to realize what that dry food meant to her. 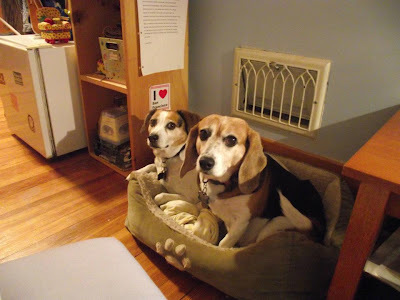 It was the only good thing she'd ever known in her life in the puppy mill and in the lab. She wasn't given treats or even scraps of people food. The only reward she ever got was a regular meal. To this day, six years after we adopted her, she still goes crazy over her dry food. She actually gets up on her back legs and does this sort of hop in front of you on your way to bringing the food to her, like a dolphin finning its way upright through the water. When we first brought her home, Frances was expressionless. She had shark eyes—doll eyes with no emotion behind them, the result of her going away inside herself so often in her previous life. One of the most rewarding things I've ever experienced in my life was watching those eyes slowly come to life. Watching her learn to trust, learn to play, to begin to find her personality and express it has been the most fulfilling thing I've ever seen. It's also been wonderful to see how our dogs comfort each other. I remember reading a study that found that the presence of another animal was more soothing to a pet than even their human. Our two little separation anxiety survivors rely on each other and are comforted by each other's presence. They're fond of each other (even though Minchy would rather we didn't know that—he prefers to take a sort of exasperated big-brother attitude to Frances when we're around). Frances gives Minchy something else to focus on; he provides her with consistency. They're starting to play together—just a few minutes at a time—but sometimes, when they don't think I'm looking, they chase each other round and round in the backyard. While personally I think all dogs are wonderful, there's just something so special about adopting one from your local shelter or rescue group. The satisfaction of knowing you not only saved their lives, but gave them a second (and often better) chance at happiness is enormous. At the shelter, we were convinced that adopted dogs were well aware of the second chance (and third, and fourth, and …) they'd been given and were truly appreciative. The best way to test out this theory? Adopt a shelter pet yourself! Hey, this is a sweet story and the photos are great too. Glad to see this blog humming along beautifully. Hi, Deborah, thanks for reading! Oh my gosh. That is just so sad. I feel so bad for the dogs that are used for research, and for the dogs used for breeding in mills. Thank you for giving her such a wonderful home. Always nice to hear a happy ending.